A low-carb high fat Keto Smoothie to snack on or to have for breakfast! No sugary fruit, no sweeteners, only low carb veggies, high fat avocado and ginger, lemon and cilantro for that special flavor! Who knew creating keto smoothie recipes was about the hardest thing ever?! 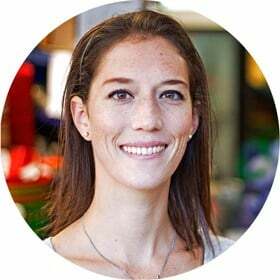 Mostly, I felt is was easy to create keto diet recipes until now, but sweets and smoothies? Not so much. The fact that the keto diet is mostly fruit-free and only allows a couple berries and that any sort of sugar, even a natural one like honey, is a big no no, makes creating a yummy smoothie super hard. Let’s be real here for a second. I’m not a huge fan of smoothies made with too many vegetables. I looove vegetables, don’t get me wrong. My whole diet and blog and life’s work revolves around vegetables. Both, raw and cooked. In smoothies and juices, however, ugh. Not so convinced. I prefer a delicious fruit smoothie without yogurt for example. 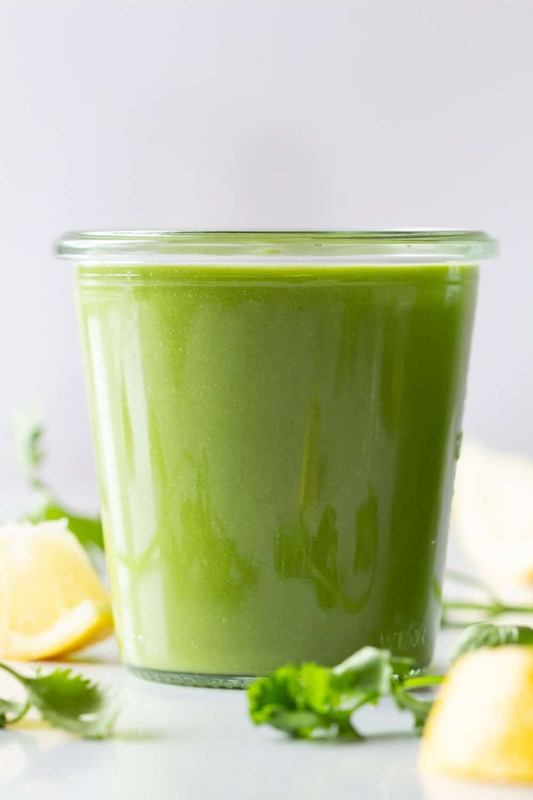 I DID take on the challenge though and I’m happy to say that after 29043875 attempts on a delicious keto smoothie I’ve come up with a recipe for a really good keto green smoothie. Phew! For desserts I think I’m going to pass. It’s so hard. I have a friend who went through the hurdle already though and she created a super Easy Keto Chocolate Mousse. WOAH! Adding oil to a smoothie can be a smart idea, especially great oils like MCT, it does taste kinda oily then though and not so smooth. Mostly, smoothness in smoothies is acquired by adding banana which is the highest carb fruit ever so no bueno. 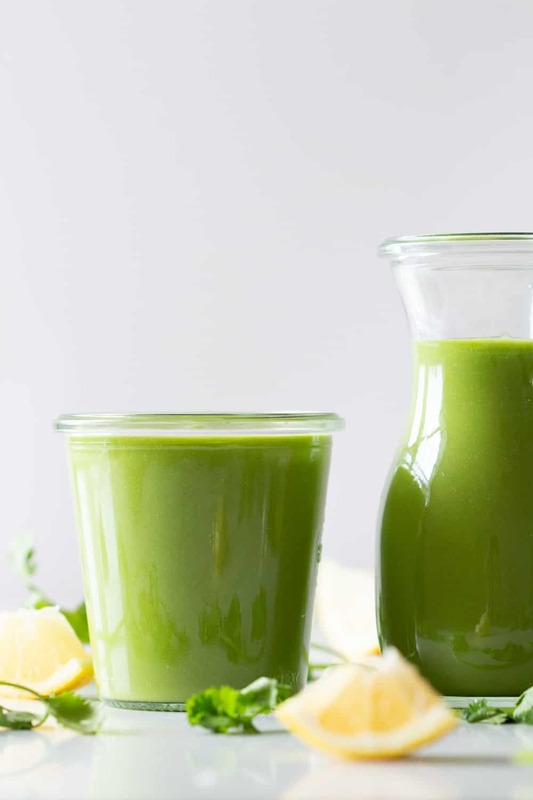 The smoothness in this keto green smoothie comes from…..*drumrolls please*…..avocado!!! The best fruit ever on the planet. An extremely healthy fat and absolutely delicious! 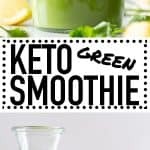 I love to use frozen avocado for this Keto Avocado Smoothie because 1. I don’t have to plan ahead and always have ripe avocados on hand and 2. It gives me an ice cold smoothie. And just in case you were wondering. No, it doesn’t brown right away. I’ve kept it in the fridge for several days to test and it stayed green the whole time. The lemon keeps it from browning. You have to keep it in an air-tight container though. So it doesn’t oxidize. The best way to make a low carb smoothie keto is to avoid adding any fruit other than lemon and avocado. Avocado is a fruit but it’s very low in sugar and high in fat which is what we want here, right? It has only 3g of sugar which come mostly from the lemon actually. Net carbs are only about 7g and fat is at 11g. Perfect breakfast! It kept me full all morning. It does take some getting used to but after the third sip all three, my husband, my daughter and me started really liking it. It’s the weirdest thing. You give it a sip and think: meh. then you give it another sip and think: oh, it’s not that bad actually. Then you give it another sip, and think: wait a second, I think I actually like it. The funny thing is, this happened to all three of us! Isn’t that crazy? I actually thought my daughter wouldn’t like it but she drank a whole serving of it. Store in an air-tight container such as a mason jar in the fridge for up to 3 days. Jamie who left a comment on 24th Jan.
She does not need to do anything! All these lovely recipes are being shared free of charge, have some respect. I am also from the UK and understand what 1/2 a cup means. Yes, avocados should always be ripe for consumption in any kind of recipe. I mean you “can” of course it unripe but it tastes gross. 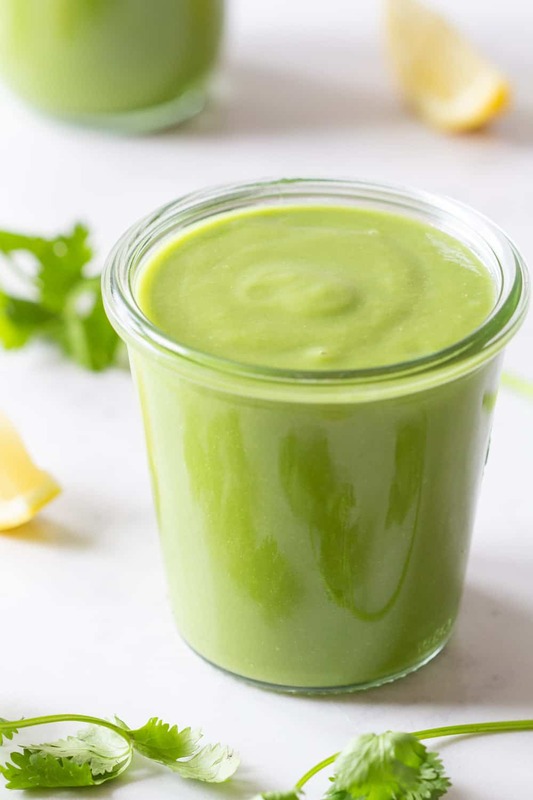 I want to try this Keto Smoothie, but I don’t like the taste of cilantro. Is there a substitute? Also, can MCT oil be used as well, or is that too much healthy fats? Hi Melody, you can use basil instead. Both cilantro and basil are soft and mild herbs that are the best replacement of each other in pretty much any recipe. The MCT oil can definitely be added if you need it. The amount of healthy fats you want in your smoothie depends on your whole day’s nutrition. If you eat rather low-fat during lunch and dinner it might be a good idea. If you’ve reached your daily calorie intake with what you have planned for the day then it might not be a good idea. It’s all about what you’ll eat the whole day/week. Am allergic to avocado, what can I substitute for it in this recipe? I’m afraid there is nothing you can replace it with. The keto diet requires high amounts of healthy fats and close to now carbs and avocado is the only thing I can think of as being high fat / low carb that can make a smoothie creamy. Coconut milk is obviously high in fat, too but it’s also much higher in carbs…. I’m afraid I don’t have a replacement suggestion for you. I’m sorry. You really need to give ingredients in grams. A cup has no meaning, especially if you are in UK!! Not sure where the nutritional values come from when they are precise but measurements are not? Dear Jamie, 85% of my audience is in the US and Canada which are both countries that use imperial measurements. It doesn’t matter what you and I think is better for recipes. It only matters what the majority of my audience wants and needs. I do give measurements in grams and ml when it’s very important, such as in bread baking. Other than that I create recipes with what Americans and Canadians work in the kitchen. A US imperial cup is 236ml and you can buy a set of measuring cups on amazon.co.uk for less than £10. Since they are a standardized volume measurement that’s how the calculator can base its calculations off of. I do agree that it will never be as exact as when using grams but, again, those aren’t measurements the majority of my readers use. You could use water maybe. Cucumber is mostly water anyway. I made this today. It was just what I was looking for. Thank you. Awesome! I’m so happy you found what you were looking for :) Thank you for coming back and rating and commenting. I really appreciate it! 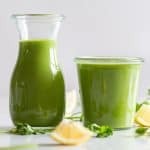 What are the recepie measurements for making the keto lemon breakfast drink? Hi Brenda, I’m sorry, I don’t know what breakfast drink you are referring to. I don’t know that recipe, it wasn’t developed by me. On your avocado smoothie, I use an pure organic ginger root powder also, can I substitue for ginger peeled and how much? In other avocado smoothie I use 1 Tbsp. of the ginger powder, and How do you freeze your avocados, I didnot know you can, how do you prepare it for freezer? Does 1 c up avocadao = 1 whole avocado or 1/2 avocado? Also I freeze organic lemons and grate them in smoothies ect. Financiall y for me , they go farther,, and the peel ect is very healthy for you, a pprox, how many Tblsp of grated lemon, I’ve done 2 generous Tbsp of grated lemon in other smoothies or upto 4 Tbsp. Hi Connie, I buy my frozen avocado at Costco. Generally if you want to freeze your own you just wait for it to be ripe, then destone and peel it, then cube it and put on a parchment paper lined or non stick baking sheet in one layer in the freezer until frozen so they don’t stick together. Once frozen you can add to a freezer bag and keep in the freezer. I’m not sure how much one cup frozen avocado is. Depends on the size of the avocado. I’m not sure how much ground ginger or lemon zest to use, I’ve never tried. You’ll have to test what you like best. I’m so used to having sweet fruit smoothies in the morning, this smoothie was a change of pace for me. Jury’s still out on the final verdict. Maybe an orange instead of the lemon for me as I found it to be a little “bitter”. Will see. Super healthy and will try again for sure.